Shorty Joe, a local country music legend, is a remarkable guy. His life story tells of a young boy who goes on to be a bandleader like the idol he grew up listening to on the radio. And with all his music-related achievements as deejay, songwriter, performer, promoter, and recording artist, he remained a hard-working pragmatist never giving up his day-job. 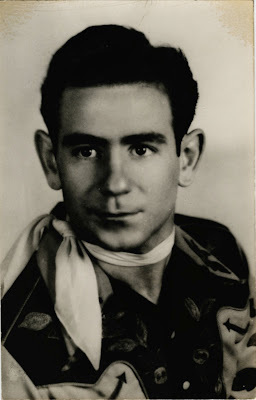 Shorty Joe was born Guiseppi Quartuccio in Monreal, Sicily in 1924. His family moved to America, eventually settling in San Jose in 1936. As a poor immigrant, Shorty Joe learned early on the hard work ethic that would become part of his life. By age 17 he was working long hours in the canneries. From 1942 to 1946 he worked as an aircraft mechanic in the Navy. Upon his discharge he continued this line of work at Ames Research Centre. For over 30 years there, Shorty Joe was a part of “The Right Stuff.” During this exciting time he worked on the development of early jet planes and was Assistant Branch Chief of the Simulation Operation Branch. This involved working with 6 of the original 7 astronauts, building and operating the early centrifuge trainer, and working contact with Chuck Yeager in the quest to break the sound barrier. Today, retired 20 years, he is still active organizing cruise trips. All during this time his passion was music. As a young boy he listened to the radio and fell in love with western music. One of his early thrills was getting to see his heroes, The Sons of the Pioneers. Shorty Joe was about 14 years old when The Sons came to San Jose for appearance at the State Theatre. Unable to pay the 10¢ admission fee, Shorty Joe went around to the stage entrance hoping for a chance to see the group show up. It wasn’t long before a 1936 Dodge adorned with big longhorns on the hood arrived. Shorty Joe asked the driver if there was a chance to meet Bob Nolan, the leader of the group. The driver asked the young San Jose boy what he knew of Bob Nolan. As the driver listened, Shorty Joe rattled of Nolan’s life story. The driver, impressed by the young fan’s knowledge, reached out his hand and introduced himself as Bob Nolan. Finding out that Shorty Joe could not afford see show, Nolan told the boy to follow him backstage where he was given a seat. About this same time using a similar approach, Shorty Joe met his number one idol, Dude Martin. Over KLX radio in Oakland, Shorty Joe had listened to the nightly broadcasts of Dude Martin and his Nevada Night Herders. Later, as simply the Dude Martin Gang on KYA, San Francisco, Dude Martin had become the top western band in the region. Dude Martin took a liking to the short Italian kid and would let him into his shows whenever he showed up at a performance. 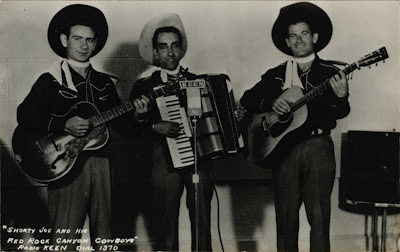 Shorty Joe eventually started a small trio of two guitars and accordion with material exactly like Dude Martin’s. The trio entered and won an amateur contest at the Victory Theatre in San Jose and from there started appearing in parades and nightclubs. After an interruption from World War II, the trio got back on track opening the Club Metro on Alum Rock Avenue. The success there led to an offer to Shorty Joe to become the first western disk jockey on KEEN radio in San Jose. The group also would do a live broadcast from Club Metro. With this new found success, it was clear Shorty Joe was bound for bigger and better things. The band would grow from three to eight, the Club Metro would give way to eventually Tracy Gardens, and Shorty Joe would move from 500 watt KEEN radio to 5000 watt KLOK radio. These progressions came rapidly. Moving first to a barn at Aissis Ranch in San Jose and then to the new Bayshore Barn in Santa Clara (a large quonset hut that later was the Carnation Milk site), Shorty Joe needed to increase his nightclub band to meet dancehall needs. Shorty Joe hooked up with Hank Doust, who became his manager, and increased the trio to a sextet. The opening night at the Bayshore Barn drew over 400 people; A big turnout in those days. The success there eventually got Shorty Joe and his band, The Red Canyon Cowboys, the offer to come to the already established Tracy Gardens. Until 1953, Shorty Joe and the band would hold forth at this fabled dancehall (the Valley Fair Macy’s is built on the Tracy Gardens site). Now at powerful KLOK, the band’s live broadcasts reached a bigger audience. This enabled Shorty Joe to not only draw big crowds but to also book name acts, like Hank Williams, Lefty Frizzell, and Roy Acuff. The band also made a few records on GOLDEN WEST and BELLA labels. With his fascinating and secure day-job, Shorty Joe resisted the uncertainties of a career as a musician. Not travelling far from his home base, Shorty Joe may have hurt his chances at greater fame. But when Tracy Gardens was closed the talented musicians who played in his band went on to play with name artists. Steel guitarist Pee Wee Whitewing played with Hank Thompson and Lefty Frizzell among others. Bobby and Larry Black did session work and toured with several stars. In 1985, Shorty Joe and his former band members got together for a sell out reunion at the Italian Gardens (500 people turned away). A second reunion the next year was again successful. Now a third reunion is planned that will be on a cruise. It will be a tribute to Dude Martin, who inspired, encouraged, and gave Shorty Joe a big break when Martin asked Shorty Joe to fill for him at a dance engagement. Look for information for this upcoming event. If Shorty Joe is involved you know it will be a great time. Footnote: The third reunion, mentioned above, took place on 9th & 10th May 1992. This article was originally published in CALIFORNIA COUNTRY MUSIC NEWS (October 1991) and is reprinted here by kind permission of the author. My grandmother sang with Shorty Joe at Tracy Gardens, and with Dude Martin before that. Where can I find more about him, Tracy Gardens, and the local music scene of that era? What a nice man. I was visiting him a few days ago. He shared a very intersting life with me.